Melissa Rushefski is a wellness educator who specializes in working with young people with disabilities and their families. She believes that lasting health and well-being arise from a spirit of self-worth and belonging. Throughout her career Melissa has supported many courageous individuals to develop meaningful relationships with themselves and others within creative recreational frameworks. Melissa holds a Bachelor’s Degree in Psychology and Sociology with a minor in Human Rights from the University of Connecticut. She has built a career in the pursuit of equality and diversity and is committed to co-creating spaces where everyone is welcome. 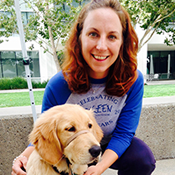 Melissa has worked with the San Francisco Recreation and Parks Department through Adaptive and Therapeutic Recreation, leading programs for campers with disabilities and peers. She has also developed special education wellness curriculums for the San Francisco Unified School District and enacted important community outreach in underserved communities. As the new Executive Director of KEEN San Francisco Melissa looks forward to cultivating fun and inclusive environments that will inspire athletes, volunteers, and families, thereby strengthening our Bay Area communities. Melissa can often be found listening to live music, enjoying wild nature, and practicing yoga.